Ballymena manager David Jeffrey was delighted to see his side bounce back from a League Cup final defeat to Dungannon Swifts by beating them 3-2 on Tuesday hight. The Sky Blues won 3-2 at Stangmore Park to close the bap on Glentorab. 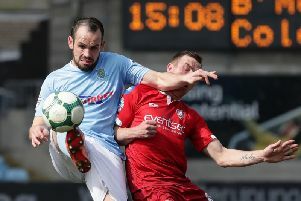 Johnny McMurray, Tony Kane and Leroy Millar were on target for Ballymena while Daniel Hughes netted twice for the Swifts who had Paul McElroy sent-off. “We are delighted because it’s been a very mixed few weeks. We’e had the absolute high of winning the League Cup semi-final, playing fantastically well, against Cliftonville. “Then we had the final at Windsor, where as I’ve already said Dungannon were much the better side. “We had a respectable performance against Crusaders, then a most disappointing result to Ards, so to get back on track tonight is very pleasing. Tonight it was all about getting the result. “It was a very good game, as it always is between the two sides. There’s never much between us, and it’s always nip and tuck.